USAG YONGSAN - U.S. Army Garrison Yongsan hosted the 2017 Volunteer of the Year Recognition Ceremony April 28, at Commiskey's Community Activities Center. Eighth Army Commanding General Lt. Gen. Thomas S. Vandal was the guest speaker. "We have the responsibility to nurture the alliance through volunteering in the Korean community. And likewise, we nurture our hometown of Yongsan through volunteering," Vandal said. Two families and more than 60 volunteers were nominated for awards in six categories -- family, 18 and under, retiree, active duty, foreign national, and civilian. The winners were selected based on their volunteer activities during the period of April 1, 2016 - March 31, 2017, through a rigorous evaluation process conducted by a panel of five judges. Each judge spent approximately four hours to complete the process, said Jennifer Jenkins, the volunteer coordinator at ACS. 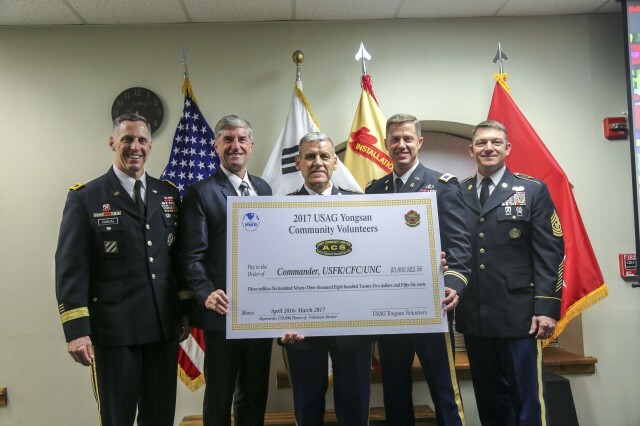 This year, the number of hours dedicated to volunteer services exceeded 150,000 hours, which is equivalent to approximately $3.7 million in monetary value across USAG Yongsan. "Tonight, 67 different nominations represent over 2,000 volunteers of the USAG Yongsan community. Volunteers are an indicator of how strong this community is," said U.S. Army Garrison Yongsan Commander Col. J. Scott Peterson. 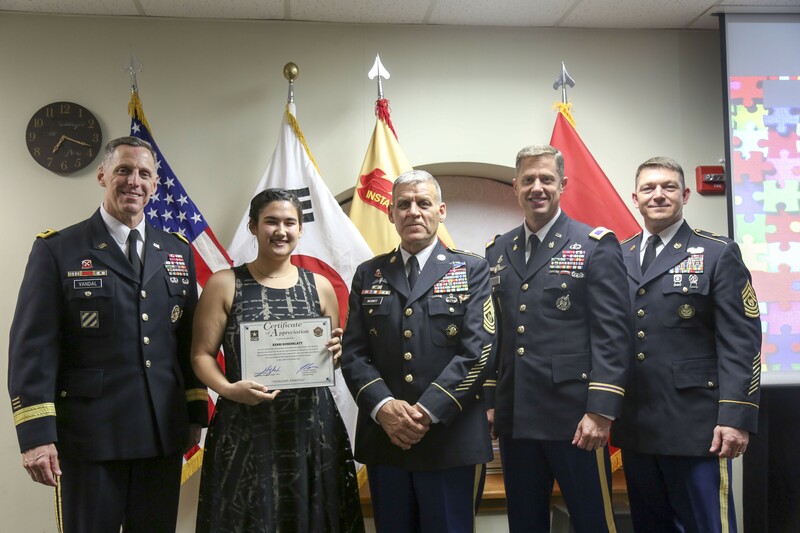 The winner and the runner-up in each category received a plaque and a certificate of appreciation presented by Vandal, Peterson, USAG Yongsan Command Sgt. Maj. Joseph M. James and Eighth Army Command Sgt. Maj. Richard E. Merritt. In line with tradition, a ceremonial check in the amount of $3,693,822.56 was presented to Vandal by Volunteer of the Year Wayne Clark. "It is just wonderful for me to help out in the community. There are so many things to do here, like the Good Neighbor program, Spring Festival, Red Cross and USO," said Clark. "A common trait between volunteers is that they volunteer not for money, but for smiles. In the military, this is a great time to get involved with your children and organizations. Everybody thinks they're so busy, but ... make time to give. You'll receive much more participating in all of the wonderful activities." Civilian category: Kerri Rosenblatt (winner); and Martina Correa (runner-up).